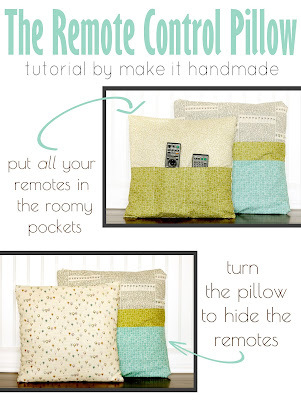 Make It Handmade: Remote Control Pillow at I Heart Organizing! Remote Control Pillow at I Heart Organizing! My post is up at I Heart Organizing today! It's a tutorial for a Remote Control Caddy. I was trying to come up with a project that would be simple to sew, but also useful for organizing. I think this fits the bill. We've been using the pillow for a few weeks now, and it's great! All the remotes are right where we want them at the end of the day. Head on over to I Heart Organizing to get the tutorial.